Belching is the expulsion of gas from the gut through the mouth (eructations). Bloating may occur due to gas trapped within the gastrointestinal tract and this is often relieved upon belching. 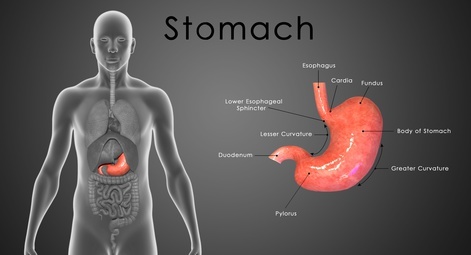 Belching and bloating may be due to food, eating habits, or disorders in the stomach, small intestine or gallbladder. Bloating and gas may not always be expelled or relieved by a belch and other factors and conditions should be considered in cases of excessive bloating and gas. This may be voluntary or involuntary. Air usually enters the esophagus and is expelled as a belch. It usually does not cause any discomfort or bloating. Treatment is by removing the cause. Carbonated drinks like soda and beer cause a build up of gas within the stomach and esophagus. This is then expelled as a belch. Certain antacids cause the formation of carbon dioxide as a byproduct to neutralizing stomach acid. However, air swallowing when drinking too fast or with other causes of mouth breathing can also increase gas in the upper gut. Treatment is by avoiding carbonated drinks and excessive amount of antacids. A simple method is to take several short gulps of air. The air should be swallowed partially so that it remains within the esophagus. Once there is sufficient air build up, the air can be regurgitated similar to a burp. This method should not be used excessively immediately after a meal as it can trigger vomiting at times. A baby should be carried upright and supported against the shoulder while a gentle rubbing motion is conducted on the baby’s back. Other methods that may assist is supporting baby in a 45 degree angle between the upright and supine (lying flat) position. Gentle taps on baby’s back may assist in this position to trigger a burp. There is no set time for a baby to burp. Infants tend to swallow air when drinking so it is advisable that baby should burp within 20 minutes after a feed. However baby may burp well after this period quite naturally. A person with hiatal hernia may be without symptoms for long periods of time. Acute symptoms include pain or discomfort after eating, sensation of ‘fullness’ after small meals, belching, indigestion, heartburn, acidic taste in mouth. There may be pain under the left breast or upper middle abdominal pain. A hiatal hernia cannot be seen or felt from the outside. Upon palpation (touching the area with firm pressure), there may be some tenderness in the upper left quadrant of the abdomen. This correlates with the area of the stomach and diaphragm. Diagnosis. An x-ray is usually sufficient to identify the hernia. Most soft organs and structures in the human body are almost transparent on an x-ray while solid structures, like bone, is opaue. In order to highlight and define semi-transparent organs on an x-ray, radiologically active substances, like barium, needs to be used internally. By drinking a barium solution, the gastrointestinal tract becomes more visible on an x-ray. Helicobacter pylori is a bacterial species that infects the stomach causing an increase in gastric acid and damaging the lining of the stomach. H.pylori infection may contribute to belching and bloating as the bacteria produces and metabolizes ammonia resulting in the release of carbon dioxide. This production and metabolism of urea by the H.pylori bacteria is the chemical method by which it survives in the gastric acid of the stomach. In chronic infections, the large population of the H.pylori bacteria can contribute to small but significant quantities of carbon dioxide gas within the stomach. H.pylori infection often causes peptic ulcers. H. pylori can be diagnosed with a range of tests using blood, breath and stool samples. Antibodies to H.pylori within your blood sample can indicate a current or previous H.pylori infection. A breath test is more reliable to indicate a current H.pylori infection as the presence of urea in the expelled breath can indicate the presence of the H.pylori bacteria. A stool sample may be useful for antigen testing to identify a current H.pylori infection. A biopsy of the gastric mucosa is one of the most effective methods to identify H.pylori infection but is not often the first choice of testing due to the invasive procedure that has to be conducted in a suitable clinic or hospital. It is advisable to treat H.pylori infection with antibiotics in combination with proton pump inhibitors like omeprazole. The proton pump inhibitors allow the gastric lining to heal while the antibiotics kill existing bacteria and prevent further growth of the bacterial population. Treatment is fairly successful but a proton pump inhibitor may have to be used for a period of time after the infection for maximum benefit. The chances of recurrence of the H.pylori infection is high and the case should be constantly monitored. Antibiotics use may further aggravate the inflammation of the gastric lining and repeated courses may be required. Prolonged antibiotic use can also affect bowel movements and a suitable probiotic may be necessary. It is essential to carefully diagnose gastroparesis as it causes similar symptoms to gastrointestinal obstruction due to cancer, pylorostenosis, or bezoar. A gastric emptying study uses radioactive material to monitor the flow of the stomach contents. This is useful in differentiating if the gastroparesis is also affecting the small intestine. An endoscopy may also be useful to verify that there is no obstruction by a tumor in the stomach or intestines. A liquid or semi-solid diet is advisable and nutritional value should always be considered. Large amounts of fat within the diet is not advisable and fat should be avoided altogether as a precautionary measure. Fat is not well tolerated by the gastrointestinal tract and requires significant intestinal motility (peristalsis) to churn the fatty foods with bile and other lipase enzymes to breakdown the fats. Alcohol is not advisable in gastroparesis as it may further aggravate the delayed gastric emptying. Treatment of gastroparesis may be through a combination of dietary changes, drugs, electromechanical devices or surgery. Intolerance to certain foods may arise from disorders in the digestive or absorption process with the gut. Lactose intolerance arises from the lack of the digestive enzyme lactase. Hereditary fructose intolerance is similar to a lactose intolerance in that there is a hereditary lack of enzymes to metabolize fructose. Fructose and sorbitol malabsorption may result in a reduced absorption of these carbohydrates by the gut thereby allowing intestinal bacteria to consume it. The consumption of the lactose, fructose and sorbitol by intestinal bacteria gives rise to hydrogen gas. Symptoms of food intolerances and malabsorption are belching, nausea, bloating, abdominal cramps, diarrhea. A rare hereditary fructose intolerance (HFI) may cause more severe symptoms if dietary changes are not implemented. An excessive intake of fructose and/or sorbitol may result in vomiting, jaundice, fatigue, enlarged liver and seizures. Colonic bacteria consumes the undigested lactose, fructose and sorbitol producing hydrogen as a byproduct. This hydrogen is detectable by breath tests. A stool sample high in acidity may also assist with diagnosing a food intolerance. A lactose tolerance test may be advisable to establish lactose intolerance. A diet excluding these foods is essential. In lactose intolerance, dairy must be discontinued and a strict lactose free diet must be followed. Fructose intolerance and fructose or sorbitol malabsorption also require dietary changes. An increased population of intestinal bacteria within the small intestine results in an increased gas production within the gut. The intestinal bacteria are able to consume nutrient laden food which has not as yet been absorbed by the body. Gas is produced as a byproduct resulting in belching and bloating. Symptoms of SIBO are belching, bloating, abdominal pain, flatulence, diarrhea, and symptoms of nutritional deficiencies. A fluid sample from the small intestine will reveal a large bacterial population in small intestine bacterial overgrowth. A xylose breath test can also assist with diagnosis. Oral antibiotics is usually effective in treating small intestine bacterial overgrowth. Nutritional supplements may be prescribed to treat nutritional deficiencies. Biliary stasis is the reduction or absence of bile production or secretion into the gut. Bile is essential for the breakdown of fats within the food. Biliary reflux is the back-flow of bile up the small intestine and into the stomach and esophagus. 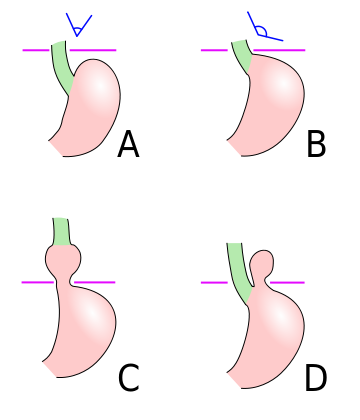 Dysfunction of the pyloric valve that separates the small intestine from the stomach. Symptoms of biliary disease: pain in the upper right quadrant of the abdomen, nausea, vomiting (bile may be regurgitated in biliary reflux), belching, bloating, weight loss, anorexia. Diagnosis of biliary disease is by endoscopy, blood tests (may reveal elevated enzyme levels), and magnetic resonance imaging. Treatment is with surgery, drug therapy to increase bile production, drug therapy to reduce gastroesophageal reflux assists with biliary reflux, discontinue any dietary or lifestyle habits that may be contributing to liver disease including use of drugs and alcohol.